The Import Sound Clips dialog box lets you import sound clips. You can import sound clips (.wav, .aif, .aiff, or .mp3) into an audio track at the first frame or at the current frame. If the sound clip does not already exist in your project, Storyboard Pro copies the file from its present location to the audio folder in your storyboard project folder. You must work in the Timeline view. IMPORTANT It is not recommended to work .mp3 files as it is a compressed format. Long .mp3 files may not properly sync with the action in your project. In the Timeline view, select the audio track in which you want to import sound clips. In the top menu, select File > Import > Sound Clip. Right-click on the audio track in which you want to import sound clips, then select Import Sound Clips. Right-click on the empty space below the tracks in the Timeline view, then select Import Sound Clips. The Import Sound Clips dialog box opens. Allows you to browse for and select the sound files to import as sound clips. Determines in which audio track the sound clips are added. Adds the imported sound clips onto their own new audio tracks. Adds the imported sound clips to the currently selected audio track. NOTE This option is unavailable if no audio track is selected. Determines at which frame in the timeline the new clips are added. Adds the imported sound clips at the first frame of the project. Adds the imported sound clips just after the timeline cursor. 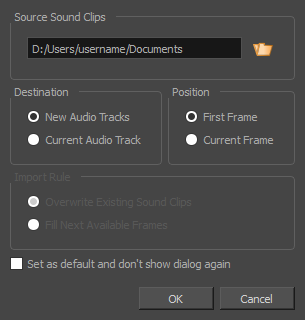 When importing in an existing audio track, this decides what happens if the clips are imported where sound clips are already present. NOTE These options are unavailable if no audio track is selected. If there are existing sound clips where the imported clips are supposed to be added, the existing clips will be overwritten. If there are existing sound clips where the new clips are supposed to be added, the clips will be trimmed just before the existing clips. If this option is enabled, the next time you want to import sound clips, Storyboard Pro will prompt you to browse for the sound files to import, and use the currently selected options without displaying this dialog.